Come and join us for a day of stitchery. Bring your own project and join us to learn new stitches . Pamala is there to help you learn. Tuffet class with Patti-Who wouldn't want one of these adorable tuffets for yourself or someone you love. Have a project you need to finish. Bring it and have Patti help you get it done. Have a new Beginning Quilting class getting ready to start. If you’ve always wanted to learn how to use the quilting tools and proper techniques come and learn with the best. It is a 6 class session. dates August 29th, September 12th, September 26th, October 10th, October 24th and November 7th. Look at this cute bag! Come and learn how to use cork for the bottom of your bag. Have you tried the new cork fabric? It so pretty. Join Judith for a fun class to make this adorable bag. Look at this cute little bag. I love how the mesh makes it so you can see what’s inside. Did you start you bag and not finish? Come and get some expert help to finish your project. How Cute is this quilt. Come and learn how to with a directional print. Gotta love stripes! How cute is this bag! I know it’s on my list of projects and Pamala is here to help me. Join us for this two part class. This is a simple, beginning English paper piecing class. Come and learn how to do the hand work of English paper piecing. One Block Wonder back by popular demand! If you’ve always wanted to take this class now is your chance. Come see one piece of fabric turn into a master piece. It will be a two class series. The first class (part One) you will cut your fabric, and sew some blocks together. The second class (Part Two) will come to class with your blocks complete, and then start arranging and sewing the quilt together. Two classes for $60. Class seating is limited, please sign up early! Part one will be Saturday February 16th and Part 2 will be Thursday Nov 1stSaturday March 16th. 10:30am - 4pm on both days. They are cute, they are fun, they make great gifts. This little Diva is so cute! You’ll love to make her. This project is a great way to show your own personality through quilting and really make it your own. Denise can’t wait to show you how! This will be a great class taught by Denise. Come make one of Patti D's adorable handbags! We sure love Patti D's pillows and Mr and Mrs Frosty are no exception. Come join us to learn how to make these cute winter pillows! It's a two part class held on back to back Fridays, Oct. 19th and 26th. If you love snowmen you’ll love making this quilt. it has some piecing and some applique for you to enjoy. Need a fun gift or something to brighten your kitchen? This is the class for you. Class fee $25 includes pattern! How cute is this apron? Who will you make it for? A mother & daughter? Granddaughter? Friend? Patti D will teach this class. You can't see in the picture, it has a nice pocket too. It’s great for holiday baking! Class cost is $25, how many will you make? I love this pouch with the vinyl on top. Bright colors make it perfect. Look at this cute pumpkin patch wall hanging. Come join in the fun! The teacher will be Stephanie Gant. Finished size is 23"x 57". We ordered some nice fabric to make a kit. Patti D. Has created this fall pillow in 4 different styles. I wish I could show you them all here, but I can’t so check them out on facebook or instagram. You won’t be able to choose just one! Her talent is amazing! Class is Sept 5ht and 12th. this is a 2 day class. Love the simplicity of this quilt. Use four fabrics to create the center. This is a great class for beginners! Pamala will help you improve your skills. Use two fabrics or make it scrappy. I’m a little teapot short…. Here’s another fabulous paper piecing quilt by Stephanie. Come join the fun Wednesday August 8th and 29th. Ever wanted to learn how to paper piece? Here's you chance to learn from the master!This wall hanging is made using the paper piecing method. Stephanie Gant will teach you all her tricks. $35 includes pattern and paper pieces. How cute are these Christmas Stocking? Come join the fun and learn how to do the lettering and sew a fun Christmas stocking. Come join the Jelly Roll Rug craze! Brighten any room, hall or doorway with one of these adorable rugs. Class will be Tuesday June 19th. Join Suzanne for this fun Tote. Who does need one of these for their belongings? Ever wondered the secrets of the pineapple quilt? Join Suzanne and learn how to make this beautiful quilt. Come join us for two day of fun! Have you had a chance to make Patti's Handbag now with a zipper? If not you'll want tojoin us for a for a two day class and get some great tips. Come and make the "Double Delight or one of Patti's other bags. Class is 2 days, Saturday April 28th and May 5th. 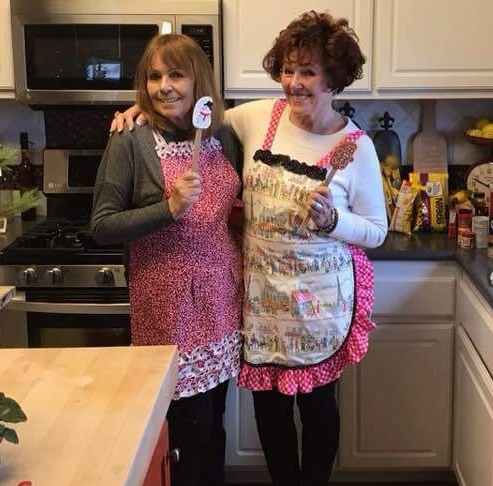 Come join us for Patti D's Apron Class. Make a Holiday apron or one for everyday. Scallops or no scallops. So many choices! Bargello is a fun class to take. If you think it looks intimidating, don't worry it's not. Come and learn from the best. 2 session Class April 17th and May 1st.